PATTI CAKES! 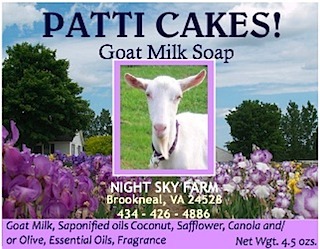 is the name of our bath and body line which includes goat milk soap, lotion, body butter and lip balm. PATTI CAKES! 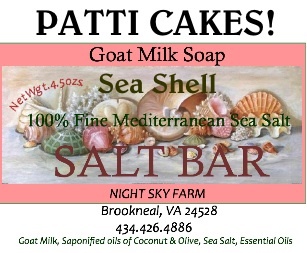 Goat Milk Soap and OUR SEASHELL BARS are sold in 4 - 5 oz bars. Neroli to name a few. OUR SEASHELL BARS contain Mediterranean Sea Salt and are gently exfoliating. PATTI CAKES! 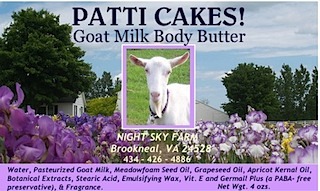 Body Butter and Goat Milk Lotion, my own recipes including no nut oils and made with apricot kernal oil, grapeseed oil. meadowfoam seed oil, botanical extracts, vit. e, pasteurized goat milk and Germall Plus, a PABA-free preservative. Highly moisturizing and scented with the same pure essential oils and blends as our other products. Sold in 4 oz jars, 2 oz jars, 4 oz and 2 oz bottles. 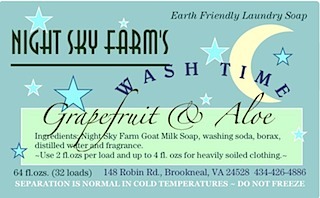 WASH TIME is the name of our Eco-Friendly Laundry Soap made with our goat milk soap, washing soda, borax, water and scented with pure essential oils and blends. sold in a 64 fl. oz jug and in a 32 fl. oz. jug. Two large jugs fit nicely in a Medium Flat Rate box. 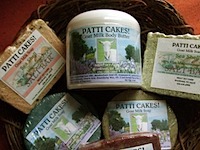 To purchase any of our PATTI CAKES! 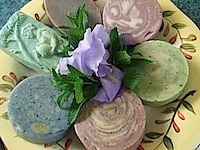 or WASH TIME Eco-Friendly Laundry Soap you can go through our website, click on the soap picture on the home page. Not all scents are available online. Or you can call the farm and order over the telephone (WE CAN ACCEPT MAJOR CREDIT CARDS OVER THE PHONE). Or you can send an email and I can invoice you through PAYPAL. We ship these products all year long using USPS Flat Rate Priority Shipping.